Monster Hunter: World arrives at PS4 next January 26th, and will give us the opportunity to get into the shoes of a monster hunter. Our main mission will be to seek and hunt fearsome beasts in an open and persistent world, where any decision we make will change the ecosystem in which we move. A lively and vibrant world full of beasts, monsters and animals of all kinds and where we must stand out as the best hunters. 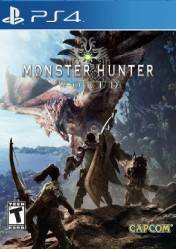 We can embark on this adventure alone or in cooperative mode, along with three other friends to hunt the world's most dangerous beasts. Monster Hunter: World continues to maintain the system of creation and progression based on the skills of this franchise, so that we can evolve our hunter to become the greatest hunter of all time, in addition to the more beasts we hunt, before we can face greater challenges. It is also necessary to emphasize the system of loot, so that after finishing with our enemies we can capture valuable resources that we will be able to use to create the definitive weapons of hunting, to equip ourselves with better gadgets and costumes, new armor, and in short a complete system of crafteo based on resources collected from the fallen beasts. The use of the land can be used strategically in our favour, so taking advantage of the environment and its resources will be decisive in the toughest battles. There are no comments yet about Monster Hunter: World. You can be the first one! MONSTER HUNTER WORLD - Conferindo a Versão de PC Desse Jogo Charmoso! Gameplay tá Show!